Pu'er tea made from tea leaves harvested from Yi Wu mountainous areas is renowned for its unique and complex flavor once it has been properly aged. 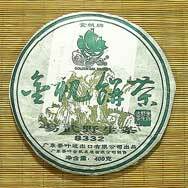 8332 Yi Wu Ye Sheng Bing Cha is compressed using very special and high quality tea leaves and buds as can be seen in the closed up photo of the tea cake. 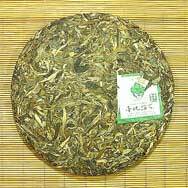 It is very likely to age well and we highly recommend this tea cake to Pu'er tea collectors. 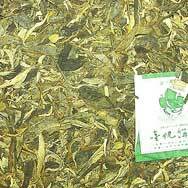 I like this tea for everyday drinking, light and delicious, i purchased 3 to taste through the years and it has mellowed and improved really well with age. Now 2015 i´ve have enjoyed this tea for 8 years. I have some Yi Wu cakes that I like, even though, like many westerners, I don’t quite get the point. I guess "calm with a plum-sweetness" would sum up my experience of the ones that have appealed. This 8332 seems to be a bit of a contrivance, since much of its sweet character seems to come from the numerous pale buds, and it does have lot of silver-bud fruitiness on the nose and palate. But it’s a nice drink, so what the hey!